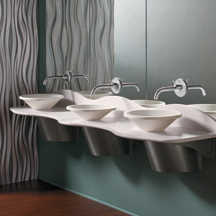 [DISCONTINUED] [XPB-LD-3072-X] Terreon® Single Station, Double Station and Three Station Bathroom & Restroom Lavatory Vessel Bowl Sinks feature a solid surface Deck with multi-height Sinks. Vessel rim heights are available in choices of 33" (ADA), 34" (ADA), and 35". ADA compliant single and multi-station Vessel Sink Decks come in three standard lengths of 30", 60", 90" and feature a waved edge. Terreon® Solid Surface Deck Material is available in 24 color choices. Vessel Bowl choices may contrast or Lav Decks and Vessel Bowls in the same choice choice will require a standard tempered supply. Lavatory system comes equipped with stainless steel mounting brackets and the vessel sink comes pre-mounted with standard choices for faucet drilling, back-splash and water supply. Upgrades for P-Traps and Trap Covers also available. Faucets are not included. Specifications and detailed information available upon request. All Terreon Lav Decks are non-cancel-able and non-returnable because they are made to order. For shipping quotes, orders or questions please call our Customer Service Center at 1-877-483-9270.